"True love for animals is one of the criteria for the staff at Candy's Pampered Pets, along with integrity, honesty, and diligence. A sit begins with trust, and ends with more trust." 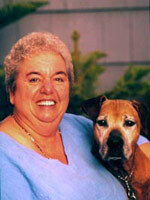 Candy's Pampered Pets was established in 1992 by the late Candy Telford, who loved all pets and animals. 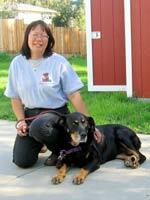 Prior to her passing, she has chosen Esther Ho, to continue her dream through providing the best possible care for all pets. For more details about Esther, click on this link: www.channeltotheheart.com. Our staff truly cares about animals. They are responsive, reliable, experienced and long-termed. Pets are kept safe, well-fed, and comfortable in their own homes. Since pets cannot verbally express their needs, awareness plays a key role in ensuring their physical and emotional needs are met. The level of care goes beyond the call of duty, and this extends to the area of home care. Dog training is available under Canine Learning with Finesse, using the most gentle, proprietary approach, “Channel to the Heart”, registered with the United States Patent & Trademark Office. Graphics & Design © 2005 Worlds by Design. Text & Photos © 2005 Candy Telford. All Rights Reserved.